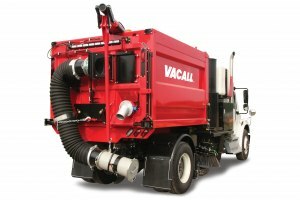 The VACALL™ AllSweep street and runway sweeper is also designed for catch basin cleaning and leaf collection. 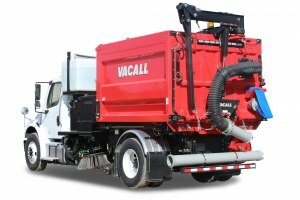 Dynamic, multi-purpose VACALL vacuum street sweepers are set apart from routine street sweepers by high versatility, high performance and high value. AllSweep models are exceptionally versatile, handling the work of many machines to clean out catch basins as well as parking venues and airport runways. AllSweep’s single or dual sweep system creates a sweep area that is wider than the vehicle itself – giving you the widest sweep path anywhere. Plus, AllSweep uses the chassis engine as a single power source, reducing fuel consumption and emissions as well as routine engine service cost and downtime. An independent analysis by a certified test lab shows VACALL AllSweep models can deliver a maximum airflow of 31,000CFM — the best in the industry.